I am trying a Adafruit I2S 3W Stereo Speaker Bonnet for Raspberry Pi - Mini Kit, which is built around two MAX98357 (datasheet: adafruit, maxim), on a Raspberry Pi Zero W with Raspbian Stretch (upgraded yesterday). The trouble is that I have "pops" when starting/changing tracks, even with the same audio rate. Their instructions to "fix" these add mostly redundant settings to the alsa configuration files /etc/asound.conf and ~/.asoundrc. softvol exists to be able to control volume globally (in software, wasting resolution), since the DAC does not have hardware control. But apparently some players also can do this themselves, so either should suffice. Regarding the driver, their instructions add dtoverlay=hifiberry-dac to /boot/config.txt, but the Hifiberry DAC (obsolete) is based on a (single) different chip, the PCM5102. Hifiberry list the configuration for their products at https://www.hifiberry.com/build/documentation/configuring-linux-3-18-x/. I'd like to know what the differences are and if the suggestion is a proper match for the IC. Could the driver send additional data that causes a "pop" or "crackle"? It's not in the file, I checked. And also, mplayer starts playing the identical file OK, but has "pops" between tracks, though specifiying mplayers audio output seems to almost eliminate the popping when changing tracks. Freeing 0 unused video chunks. alsa buffersize does not match the configuration's. MPD (controlled by mpc) clicks/pops once when starting to play, but then apparently "streams" continuously so changing tracks does not cause any noise. So, whatever causes the pops in the first place (hardware? driver? ), some players seem to be better at avoiding that situation (opening/reconfiguring the device). Any input on how to get to the root cause and fix it much appreciated! 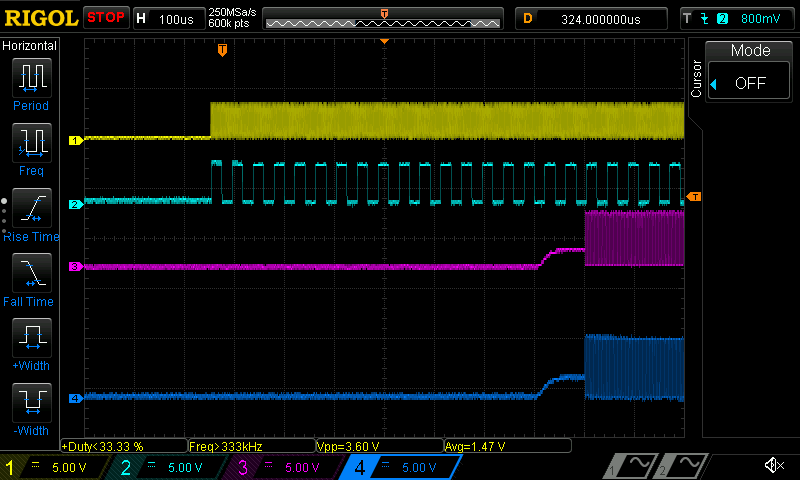 So, back to: plug -> softvol -> dmix -> I2S DAC (kernel PCM). Softvol's control is what shows up as mixer device in e.g. alsamixer. I'm still unclear on what ctl's do. Alsa usually stores it's configuration/settings persistantly. This can cause stale mixer devices to appear. With mplayer and 32kHz audio only occasional pops when changing tracks. Increasing the buffer size seems to have solved occasional "stuttering / echo" playback. dmix is the plugin removing most of the pops on play/stop. It [occasional pops changing tracks with mplayer] does not make a noticable difference whether the sources or the default rate is set in dmix slave's rate. So a specific driver exists. Is it available in Raspbian? datasheet shows different order in "TURN-ON RESPONSE (STANDBY MODE)"
starts the LRCLK on the third rising edge of BCLK and results in a nice ramp-up as shown in the datasheet, although BLCK starts first. Sometimes the pop isn't noticable, but the trace looks very similar. So is it the BLCK glitch (what causes this, it's probably not intentional) or polarity (i2s_test starts from low-level) while regular operation has high-level? Although it seems to build OK (sound/soc/codecs/snd-soc-max98357a.ko), the pi0w does not appear to boot properly after, at least it does not connect to wifi. I'll have to hook it up to a display and HID. I could not get a keyboard to work either, and it's not because I used a simple A-micro B adapter instead of a proper OTG adapter first. [  OK  ] Started Configure Bluetooth Modems connected by UART. [  OK  ] Started Load/Save RF Kill Switch Status. [  OK  ] Started LSB: Resize the root filesystem to fill partition. [  OK  ] Started dhcpcd on all interfaces. [  OK  ] Started /etc/rc.local Compatibility. [  OK  ] Started Music Player Daemon. [  OK  ] Created slice User Slice of root. [  OK  ] Started Session c1 of user root. Isn't WIFI and bluetooth on the same chip? No hardware info or actual schematics available from RPi Foundation. I might try again tomorrow (after making a backup). No need to enable i2s-mmap nor i2s, the hifiberry-dac overlay does this automatically and mmap is available implicitly since 4.9 (April 2017). right under the line with PCM5102A, and then add CONFIG_SND_SOC_MAX98357A=m to your .config before rebuilding. I'm told this sort of direct editing of .config is frowned upon, but as it stands now this module doesn't appear in menuconfig. When I load the module via sudo modprobe snd-soc-max98357a on my Pi Zero W it doesn't show any errors in dmesg, for what it's worth. If this could get you closer to your goal or at least rule something out, happy to provide you with these compiled binaries. Right, you could try editing hifiberry-dac-overlay.dts and replacing pcm5102a with max98357a. Device tree overlays are automatically rebuilt with the dtbs target in the standard kernel build flow. You have to try a more powerful RPi. The mix of the Zero W single core CPU and the Linux give a system that in some case are not so responsive. A "pause" of some milliseconds in the wrong moment is a crack or a pop. The fact that a bigger buffer helped somewhat is an important symptom. So, maybe, it's not possible to solve your problem. This is because a PWM output of the BCM2835 CPU is being used, rather than a >standard DAC. 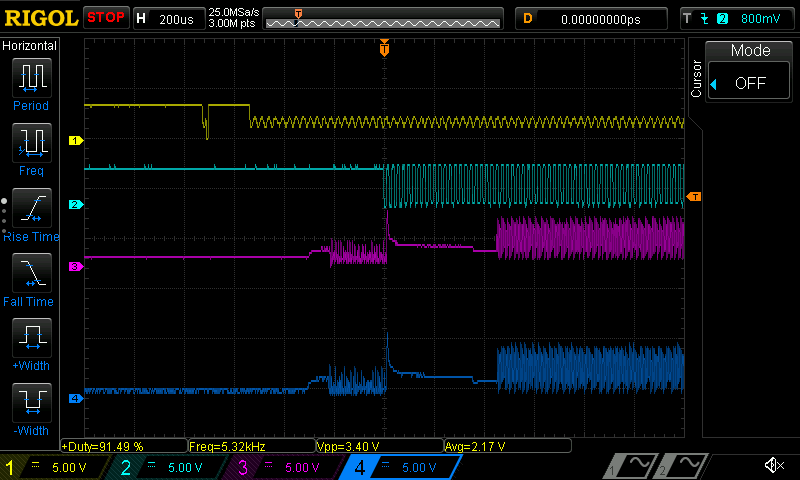 When the PWM function is activated, there’s a jump in output >voltage which results in the popping sound. Until there’s a driver modification, the work-around suggested (other than using the HDMI sound output or an external USB sound card) is to run PulseAudio on top of ALSA and keep the driver active even when no sound is being output. This is achieved by disabling the module-suspend-on-idle PulseAudio module, then configuring applications to use PulseAudio rather than ALSA. Daniel Bader describes this work-around and how to configure MPD, in a blog post. However, when I tried this approach, the work-around didn’t work. When module-suspend-on-idle was enabled, there was the popping sound but when module-suspend-on-idle was disabled, there was no sound output. I investigated this, mainly though the debug logs in /var/log/messages produced by PulseAudio after starting it with pulseaudio --start --log-target=syslog --log-level=4. I also had to look at the source occasionally too. The problem turned out to be because the audio files I was playing were mono with a sampling rate of 16,000 Hz or 48,000 Hz, and the default audio input format for the ALSA driver was stereo (with a 48,000 Hz sampling rate). When the audio was being played, PulseAudio had to change the input format to match, even if the only change was stereo to mono. This format change involves resetting the driver and so causes a pop as it is deactivated and re-activated even if module-suspend-on-idle has not suspended the driver. Once audio playback is finished, the original audio format is restored, leading to a pop then too. What is worse is that if module-suspend-on-idle is disabled there’s no audio output. When PulseAudio switches the format, the driver is suspended but never resumes. There are some comments in the PulseAudio source which suggest that module-suspend-on-idle is assumed to be available and is responsible for resuming drivers on a format change. Therefore the work-around for the popping, of disabling module-suspend-on-idle, isn’t suitable when the audio input format is not stereo at 48,000 Hz. Rather than disabling module-suspend-on-idle, the work-around I arrived on was to set a very long idle timeout. This is done by appending timeout=604800 to the line starting with load-module module-suspend-on-idle in /etc/pulse/default.pa. Now, when there was a format change, the driver is still resumed but the driver will not be suspended until a week (604,800 seconds) after the last audio has been played. Not the answer you're looking for? Browse other questions tagged driver pi-zero-w alsa raspbian-stretch i2s or ask your own question. RTLWIFI drivers without a custom kernel? How to make PCM5102 DAC work on Raspberry Pi ZeroW?